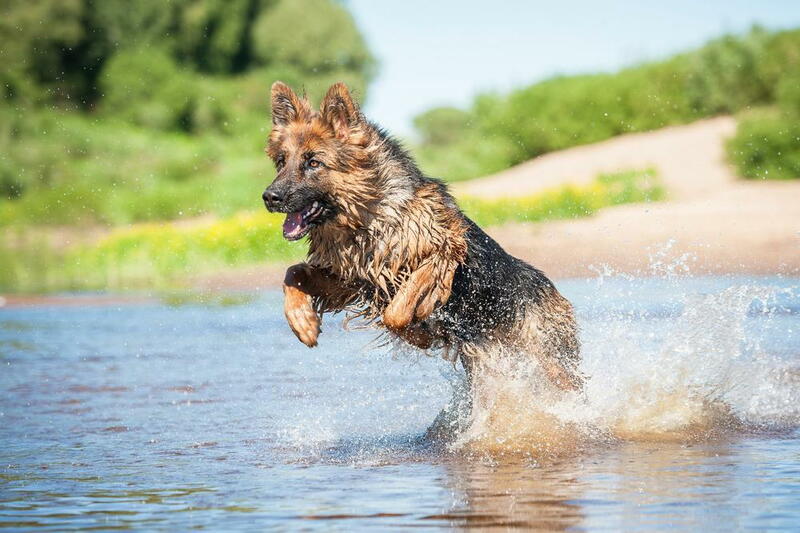 A swim is a great way for dogs to cool off and get needed exercise in the warm weather; however, not all water is safe for your pet. Blue-green algae is a bacteria that grows most often in warm ponds, lakes and anywhere water is stagnant – potentially in your own backyard. After exposure, dogs, as well as cats, birds, livestock, and wildlife can become seriously ill within a matter of minutes. This spring and summer, protect your best furry friend from the dangers of blue-green algae with these pet safety tips from your Summerfield veterinarian, The Animal Hospital at Lake Brandt. A simple drink of water can cause serious illness in pets. Dogs are especially at risk as they may gulp while playing or hunting. Practice caution with these blue-green algae pet safety tips. If you see water that resembles pea soup – with or without odor – don't let your pet near it. If you have water on your property, add fencing to block access. Keep birdbaths, fountains and pools supplied with clean, fresh water. Because there are two types of the bacteria, there is a wide-range of symptoms of blue-green algae illness in dogs. Microcystins attack the liver while anatoxins harm the nervous system. Both can result in coma or death. If your pet has been exposed to blue-green algae, seek emergency treatment at our Summerfield veterinarian. If no symptoms are present, we will induce vomiting. Otherwise, emergency care may include fluids, medications, transfusions and oxygen therapy. We are here to help. Call us for appointments or advice at (336) 643-2229. The Pet Poison Helpline can also assist in an emergency at (855) 764-7661.